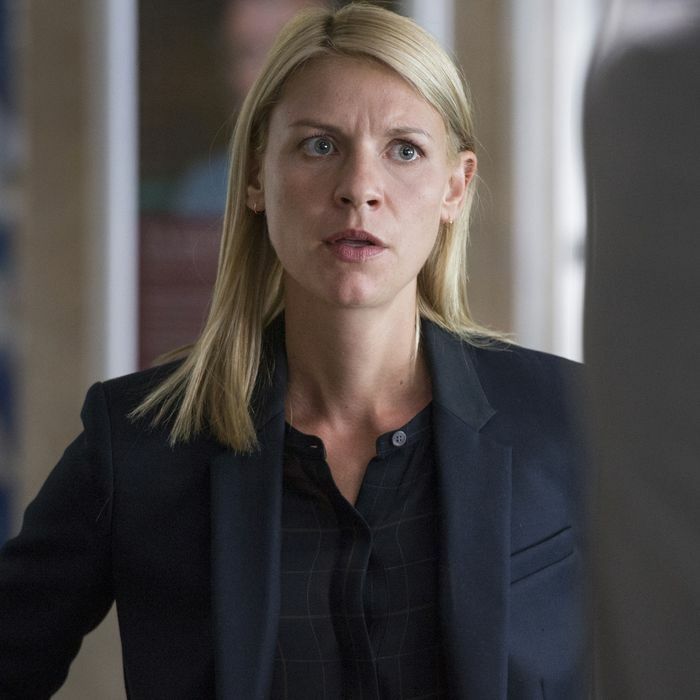 The sixth season of Showtime’s Homeland follows a pattern in place since season four: It begins by jumping ahead in time, moving to a new location, and introducing us to an array of new characters while still anchoring the show to four familiar faces. Those faces belong, of course, to Carrie Mathison (Claire Danes), Peter Quinn (Rupert Friend), Saul Berenson (Mandy Patinkin), and Dar Adal (F. Murray Abraham). “Fair Game” starts in New York City, set against a backdrop that will carry an air of what-if poignancy for many viewers: A new president is about to be inaugurated, and she is a woman. The possibly troublesome transition of power should offer an interesting fun-house-mirror version of what’s really happening in the country right now, even though it remains to be seen how Homeland will reflect the Trump administration or the changing face of international terrorism. Until that time, we have to catch up with our favorite characters. Despite saving thousands from a Sarin gas attack at the end of last season, Carrie has retreated from government work yet again, choosing to spend her time helping Muslim Americans harassed by law enforcement. Is she doing so in part because of what happened to Quinn? Does she feel responsible? That may be why she visits him every day in a VA hospital, where he’s slowly recovering from his Sarin gas poisoning. Quinn has difficulty moving and thinking, but Carrie nevertheless visits him every single day. His treatment team suggests that some space might do him more good than her constant pressure to get better, however well-intended that pressure may be. Meanwhile, Saul and Dar’s plot arc takes place in a completely different arena in the same city. They’re meeting with the new PEOTUS, Elizabeth Keane (Elizabeth Marvel, familiar to fans of politically tinged television from her time on House of Cards) and the Powers That Be are concerned she wants to dismantle most of the U.S. presence in the Middle East. Keane basically says as much in a briefing with Saul and Dar, implying that she wants to bring home all military forces from that part of the world. We later learn that Keane’s son died in Iraq, and although she didn’t make it an issue during her campaign, Dar is worried that she’ll tear down everything he’s worked to create. Saul is more optimistic that this new leader can be reasoned with. Again, an incoming president who wants to radically change the status quo — Homeland could be the most up-to-date drama on TV this year. We also meet a few new players. First, the young man who appears to be this season’s Aayan or Numan, a.k.a. the guy caught in the middle of an international situation: Sekou Bah (J. Mallory McCree). Sekou lives with his sister and mother, but he spends a lot of his time making videos about terrorism and the plight of Muslim Americans in New York City. He uploads a ton of clips, like the one about the assassination of Meir Kahane, and his activity has grabbed the attention of the U.S. government. We also check in with Otto (Sebastian Koch), who ended season five with one of Homeland’s oddest moments ever, when he basically proposed to Carrie. We learn that Carrie turned him down, but he’s back to pressure our heroine into using her notable political pull and espionage abilities once more. He wants her help overseas, working with refugees in war-torn parts of the world, and he even drops that he’s met someone else. He hopes she finds someone soon. Could it still be Quinn? It’s hard to say, since Carrie’s possible true love is nosediving to rock bottom. He busts out of the VA hospital, gets a wad of cash, and goes to a drug den where he gets incredibly high. He’s zoning out when a dude comes in with a gun — it was all a setup to get Quinn’s cash. As Quinn slowly reaches for his money, the robber hits him with his gun, knocking him out cold. Any hope that Quinn would return quickly to Jason Bourne–esque form dissipates. Back in the city, the FBI comes for Sekou, which means his plotline intersects with Carrie’s. As he sits in a holding cell, Carrie learns that Sekou was operating a website critical of America. When does criticism cross the line to hate speech? It’s an important question for America in 2017. Can a young man like Sekou be openly critical of United States policy without being a criminal? We certainly like to think that we’re not a country that arrests people for what they believe, but what if espousing those beliefs might get people killed? Sekou is accused of radicalizing people through uploads like “39 Ways to Serve and Participate in Jihad.” It certainly doesn’t help that he had a ticket to Nigeria, where ISIS-supporting Boko Haram operate, and a wad of cash under his bed. Over the next few episodes, Sekou’s arc should be an interesting window into how Homeland feels about hate speech and prosecution of those who incite violence without actually committing it themselves. After meeting with Sekou, Carrie finds out that Quinn is missing. She quickly tracks him down in the now-abandoned drug den, where he’s passed out on a bloody, dirty mattress. He doesn’t want to go back to the VA, and he freaks out when Carrie tries to take him there. She ends up bringing him back to an apartment in her building that she often rents out. He’ll be right downstairs from Carrie and her daughter — and he soon realizes he’s locked in. Carrie is determined to fix him whether he likes it or not, but is Quinn past the point where he can actually be fixed? “Fair Game” has a pleasantly slow pace, established by the lack of opening credits and the mournful music in the first scene, along with several dialogue-less tracking shots of character’s faces. It’s an interesting tone-setter for a show that can often be detrimentally hyperactive. The pace will almost certainly quicken, but it was an interesting, almost somber way to start the season. There’s another new face in the cast, but he only had one line: Robert Knepper’s General Jamie McClendon. Seen coming out of the president’s room and then in that final scene with Dar, he’s sure to play a major role going forward. You may remember Knepper as T-Bag on Prison Break or Tommy Dolan on Carnivale. He’s also appearing in the new Twin Peaks. He could be in for quite a year. The premiere used New York City beautifully, especially in the bustling background behind Sekou’s videos. Let’s hope they keep that up. Homeland has always had a strong sense of time and place; New York City in 2017 could give it quite a different feel. If you’re wondering what song was playing while Quinn was high just before the robbery, it was the Cowboy Junkies’ cover version of Neil Young’s “Powderfinger” off their spectacular album The Caution Horses.